For reasons that seemed like a good idea at the time, in the 1960s both the US and the Soviets got the bright idea that in the next war missile armed tanks would be the top “predator” on the battlefield and began to research those types of vehicles. While the Soviets eventually decided this was not a good idea and instead opted for smoothbore guns that could fire a guided missile as an option, the US pursued the idea and created the Shillelagh missile system. Basically a 152mm (six inch) guided missile that was fired from a stubby launcher tube, this weapon was fitted to both the lightweight M551 Sheridan airmobile amphibious combat vehicle as a light tank and the main armament of the prototype MBT-70 next generation combat tank. When the latter did not pan out, instead a new turret and launcher were developed for the M60 main battle tank. After testing as the M60A1E1 and M60A1E2 a production version was introduced as the M60A2 main battle tank. Fitted with a launcher for the Shillelagh, it had a reduced volume turret and new equipment to include a compressed air purge device (Closed Breech Scavenging System or CBSS) to remove the missile ejection propellant from the gun tube on launch. This was mounted in a bulge under the engine access doors at the rear of the hull. 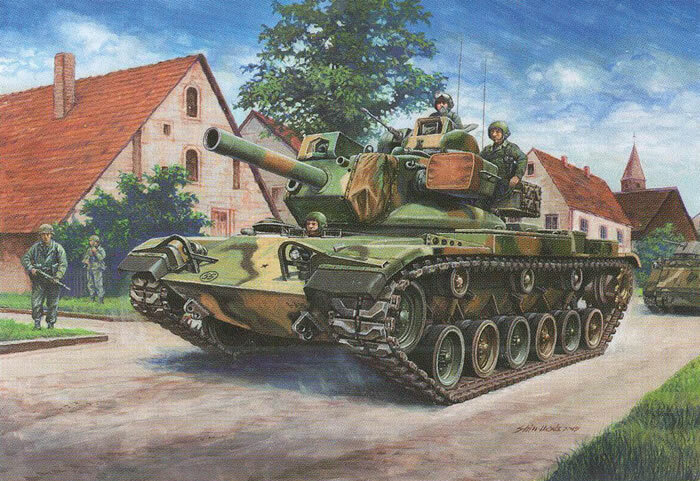 In 1966 production began and eventually 540 M60A2 tanks were built. The production models fired the MGM-51C version of the Shillelagh as well as an HE-FRAG round and also a standard HEAT projectile. The tank could carry 33 rounds of conventional ammo and 13 missiles when fully stowed. An M85 12.7mm machine gun (identical to that used in the M60A1 and M60A3) was mounted in a new design cupola. But in use the infrared tracker and radio command guidance system proved to be less than reliable and vulnerable to humidity and other weather phenomenon. While it was deployed in battalion sets (production covered exactly 10 full strength battalions albeit not all were fielded) and starred in many exercises its weapons system was a headache for maintenance crews and with the arrival of the M1 most of them were withdrawn from service. Redundant chassis were then used for the M60 armored vehicle launched bridge as was evident from the CBSS bulge under many of those vehicles. As many people have said, “third time is the charm” - ignoring the woeful Tamiya M60A2 kit from the late 1960s this is the third kit of the M60A2 to appear in the past year. Previous efforts from Academy and DML were better than the Tamiya one, but both had problem area and wound up missing the mark. Now - as Goldilocks once said - we have one which appears to be “just right”. The AFV Club M60A1 was the best kit of the tank produced thus far, with the only negative comment is the fact that there is an overdone casting texture to the turret, hatches and hull but while not quite right I think most modelers will not worry about it very much. This kit retains most of those parts and adds about 200 new or changed ones. The suspension is complete and all separate parts – welded plates, torsion bar mounts, torsion bars, and bump stops and shock absorbers are all attached to the lower hull tub. The lower hull for this kit is slide molded in one piece and very neatly done. The first seven steps cover the suspension, and while it only shows the aluminum road wheels being used you can swap them out for the cast steel ones; these even come with a separate “lip” ring for accuracy. Drivers also come with pre-molded clean-out holes. Step 4 here now adds the closed breech scavenging system (CBSS) and new tail light assemblies for the A2. The driver’s compartment comes with basic fittings to include controls and pedals. The driver’s viewer (parts C29/30 and F1) is separate to the driver’s hatch and may be turned if desired. Note from the plethora of hole blanks on the underside of the glacis (part B1) many more versions are forecast! Details are typical of AFV Club kit; for example, the external fire extinguisher controls consist of four parts (B13 x 2, B8 and E72). The entire engine deck is composed of no less than 34 parts with separate sections, lift rings and hinges; however there is no engine or interior detail (I suspect a companion Hobby Fan resin set will be offered!) The rear grilles are separate and even show casting numbers (as to all parts that require them). Note that this kit uses two bespoke doors for the rear of the engine compartment with the beveled covers over the CBSS assembly. All four stowage bins come with separate lids and handles so they also can be shown open. While the kit per se comes with the original M48 style side-loading air cleaners, this one has the more accurate top loading ones. While it offers a choice between armored and aluminum bodies, however it does not offer the very late modification of an armored collar around each one. Each one consists of eight parts. There are also two different designs of rear deck telephone boxes that attach to the rear of the hull. There is also an option for either a grille section for the right rear engine access door or the wading stack and its fitting. The new turret starts assembly in Step 23 and is nicely done. The M84 machine gun is better than the DML version and comes with a vinyl cover missing from that kit. The commander’s cupola also come with a clear ring for the vision section (N1/N4) and a hatch which may be left moveable. The bustle rack is much different in its design and assembly than the DML one and appears to be much more solid. Some complaints were noted on the internet about the size of the openings in the mesh on the bustle when the test shots were shown, but the ones provided here are about the size of the DML ones. Also unlike the DML kit the model comes with tow cables and mounts for the sides of the turret and a 5 gallon “jerry” can. The smoke grenade projectors also have caps for each tube. The searchlight also is a far cry from the older Tamiya ones and consists of 18 parts and a solid clear lens. A black vinyl power cable (T8) is provided for hookup. The kit comes with black vinyl track runs; the directions do not indicate one way or the other if they are gluable or require ACC cements. These may be replaced with any of the excellent AFV Club single link track sets such as AF35005 (T107 track) or AF35010 (T142) tracks. While the T107 is theoretically for just the M88, it is close enough to the actual T97E2 track to work perfectly. Only two finishing options are provided for this kit: an unassigned vehicle in MERDC winter verdant (forest green, field drab, FS30277 sand and black); “Aces Wild”, A Company 1-32 Armor 3rd Armored Division, Germany (MERC summer verdant - forest green, light green, FS30277 sand and black). A small sheet of decals is provided for the kit. Overall if you want a good M60A2 this is the kit to use - alas, it came out after I started an ESCI M60A1/DML M60A2 kit bash! Again kudos to AFV Club for this kit! Thanks to Tony Chin of Merit for the review sample.